You are currently browsing the archives for the Zimmer Memorial Service at Arlington category. On August 20, 2009, my first husband, Capt. Jerry Zimmer, USMC, was honored with a full military memorial service, performed by the Marine Corps at Arlington National Cemetery. 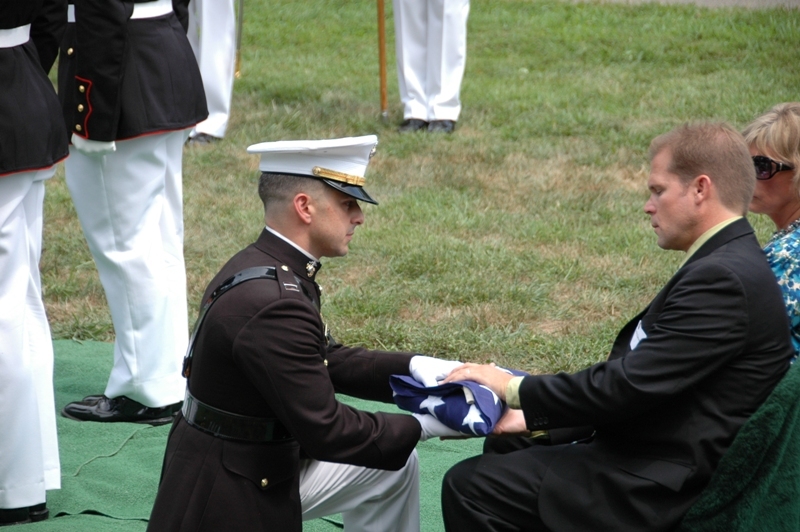 Jerry’s son, Craig, is shown here accepting the American Flag, as his father’s primary next of kin. Forty years after his death, Jerry received a headstone in a special section of Arlington for missing-in-action service members and others with similar circumstances. Many Americans will celebrate Memorial Day on Monday, May 26, 2014, in honor of the brave men and women who lost their lives while serving our country with the Armed Forces. This day offers an opportunity to remember them in a special way, as is often the case among families with wartime losses and active duty military and veterans who lost buddies while serving our nation. A lot of Americans fly the American flag, attend a Memorial Day ceremony or visit a loved one’s gravesite, giving meaning to a phrase that says it all – you are not forgotten. While in Washington, D.C. in late April, I visited Arlington National Cemetery, the final resting place for so many of our young battlefield heroes. I am always left with a sense of pride and sorrow, and this visit was no exception. My first visit to Arlington was during the Vietnam War, when Capt. Charlie Pigott, USMC, died in a horrific F-4, midair collision over Da Nang in May 1969. Most of the people who attended his funeral were wives or girlfriends of pilots, still in country and unable to come home for the service. I remember feeling so small and insignificant, surrounded by a seemingly endless mass of white headstones, yet thinking that it wouldn’t happen to Jerry. We all loved Charlie and were heartbroken about his death and the other casualties involved in the collision. Three months later Jerry was gone, too. Unlike Charlie, his remains did not come home, so Jerry did not have a funeral in Arlington, where I thought at the time all war casualties were buried, if not in their hometown. As a young military wife whose experience with death was very limited, I was unprepared at first for a funeral without a body, but reality kicked in when I learned that Jerry was unable to eject from his F-4 — a supersonic jet. I knew how much Jerry loved the farming community of Maine, NY, where he was raised and adored by the town’s people. I arranged to have a service at the family farm, knowing that it would mean a lot to his parents. That day was surreal for me then and still remains a blur in many ways. Fast forward 40 years. Our family learned that Arlington has a special memorial section for service members missing in action; remains not recovered or identified; remains buried at sea; remains donated to science; or remains cremated with ashes scattered but no portion interred, as described on Arlington’s website. On August 20, 2009, Jerry was honored at Arlington with a full Marine Corps memorial service. A headstone was placed adjacent to one for 1st Lt Al Graf, the navigator who also perished when their aircraft went down. Jerry’s memorial event was extraordinarily touching with family members present, including his son, Craig, who accepted the American Flag, with his wife and children nearby, along with many of his dad’s friends and military buddies who came from great distances to pay their respects. If Jerry’s remains are found, they will be interred in the burial section of Arlington. For more information about memorial services at Arlington, families should contact the casualty officer for their loved one’s branch of service. Marking its 150th anniversary this year, Arlington will be dressed for Monday’s event, as is the case every Memorial Day. The Old Guard recently completed their annual tribute to America’s fallen military heroes with its Flags-in ceremony, setting a small American flag at each of the 220,000 headstones in the cemetery. This tradition dates back to 1948, and belongs to the Army’s 3rd United States Infantry Regiment – a very unique unit that has my deepest respect for their patriotism and continued efforts to remember our nation’s heroes. Thank you for what you do. A special thanks this Memorial Day to all the men and women of DPMO and JPAC who continue to search for the remains of loved ones still unaccounted for from past wars. Your efforts make it possible for many families to believe that one day their loved ones might be moved from the battlefields of long ago to the sacred grounds of Arlington or another special place of honor. Many thanks to Col Bill Peters, USMC, Ret, for creating the beautiful video of Jerry’s Memorial Service. Billy was Jerry’s close friend and shared the same core values of honor, integrity and dedication to family, friends and the USMC. Both attended Brown University on NROTC scholarships and ended up meeting their future wives during that time frame. Jerry and I introduced Billy to his wife, Nancy, and they remain married with two grown children — Nancy and Jerry (named after Jerry Zimmer), along with 4 grandchildren.